I love wearing oversized cardigans, especially in winter. The aztec print also makes me feel like it's summer again. This top has become my favorite, it goes with everything I usually wear. Next week is going to be very exhausting, so I try not to think about it and enjoy my birthday haha. I also found a new great song I'm currently listening to most of the time. It's called "Ours" by The Bravery. 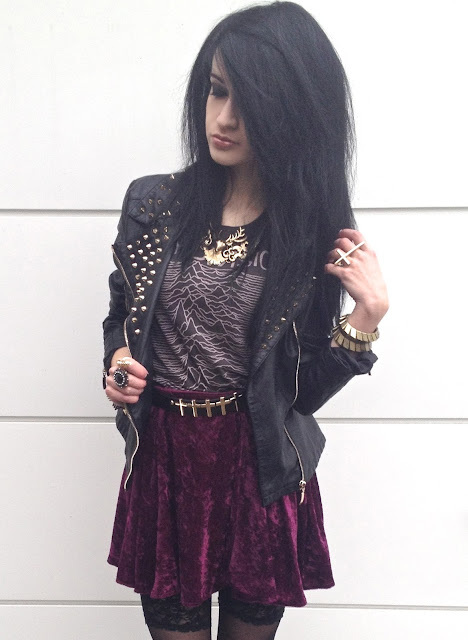 I was so happy when I got that beautiful velvet skirt and the top from the Urban Outfitters sale. I wanted a velvet skirt for so long and then I found this beautiful one. It goes perfectly with stockings in my opinion. The deer necklace is so chic and cute. I got it from my Mum when I was all sick at home, so she wanted to cheer me up haha. She's so cute! Unfortunately it's still pretty cold outside and I'm longing for summer all the time. I always look through Tumblr and see those amazing beach pics, festival inspired summer looks and the sun - I'm sick of this grey weather. Spring Daze and Songs // Win a leggings! Yesterday evening I was searching for some new and cool songs and after watching Forever 21's new "SpringDaze" commercial I totally fell in love with the song. The song is called "So Prone" by Slutever. It reminds me of summer, sun and the US. I really love it. I love the fashion, too! Hopefully the collection will also be available on the european online shop, the greatest pieces are usually unavailable here. 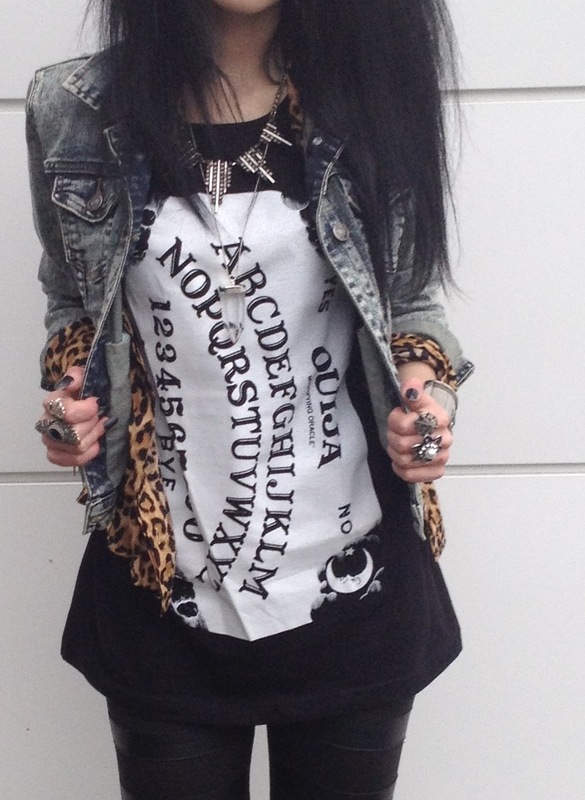 I love the quilted jacket, the american flag denim jacket und the cute bohemian inspired jewelry. The model Chloe Nørgaard is also very inspiring, I love her style and hair. Another new song is "I Come With Knives" by IAMX. IAMX also release a new album in March. "I come with knives" is the opener and it's freakin' good! It's a german-english mixture, I usually don't like german vocals at all, but I kinda like it here. and last but not least: "Touched" by Vast. 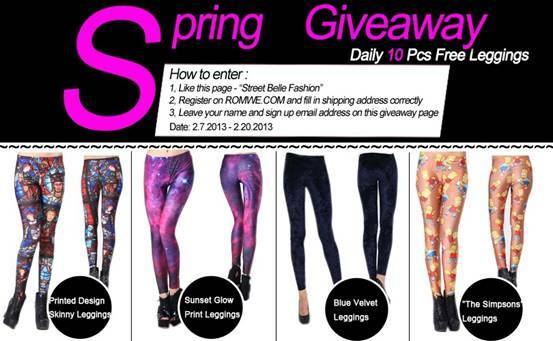 And here you can win an awesome leggings, check it out! Don't Mess With Ouija Boards. Many thanks to Kill Star Clothing! I love the print so much, I'm a big fan of magic stuff, I think it's pretty fascinating. Only one week left till my holidays (5 days) begin. I'm already pretty excited and on 24th February I celebrate my birthday. I can't wait haha.